There is an expression, saying something along the line of "Nothing is so bad, that there is not something of good in it". And this seems to be an appropriate header for this long sought for documentary about the consequences of cousin marriages over time. It seems as if the backwardness and xenophbic nature of Islamic marriage customs is actually capabel of reversing evolution itself, and give scientists the opportunity to study the transition from ape to man anew. Five adult siblings who can walk only on all fours have been found in Turkey, researchers say. These human quadrupeds may provide clues to how humans evolved to stand on two feet. The three sisters and two brothers may offer insight into the way our apelike ancestors moved, according to scientists. Human ancestors are believed to have begun walking on two legs more than three million years ago. Discovered in a remote area of southern Turkey last summer, the family of ethnic Kurds has sparked a scientific debate, which will be covered in a BBC television documentary that is set to air on March 17 in the United Kingdom. The family's exact location and last name have not been disclosed. 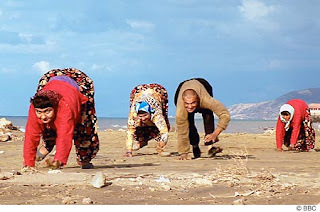 Born with a genetic brain abnormality, two of the sisters and one of the brothers are thought to have only walked on all fours their entire lives. The two other siblings can walk upright for short distances. The siblings' parents are closely related and have had 19 children in all. This bizarre case is not a hoax, according to experts who have studied the family. The cause of the four-limbed locomotion, however, is a bone of contention among the researchers. Uner Tan is a neurophysiologist—a doctor specializing in the functions of the brain, spinal cord, and nerves—at Cukurova University in Adana, Turkey. Meanwhile German geneticists believe the siblings' genetic abnormality may have knocked out the gene responsible for bipedalism, or two-legged walking, in humans. Another team of researchers, including British evolutionary psychologist Nicholas Humphrey, say the cause is twofold: the way the siblings were raised and brain damage resulting from the genetic defect. MRI (magnetic resonance imaging) scans suggest the brothers and sisters have a form of cerebellar ataxia. The condition affects the brain's cerebellum, which is located at the top of the neck and is associated with balance and muscle coordination. In children cerebellar ataxia leads to difficulties in balancing and coordination. Yet this ataxia in itself wouldn't explain why the siblings never found their feet, according to Humphrey, of the London School of Economics and Political Science. "The documentary shows a boy with no cerebellum at all who is nonetheless walking and riding a bicycle," said Humphrey, who studied the family in Turkey. "So having a damaged cerebellum doesn't explain why these kids ended up walking on all fours." "The mother says all of her children, when they were infants, ran around on all fours before they learnt to walk," Humphrey added. "Not just ordinary crawling, either—these kids ran around like monkeys on their feet and hands." Known as a bear crawl, this form of locomotion is not unknown in children. But because the brain-damaged brothers and sisters would have had problems standing up, "there's actually quite a good chance that they would make the best of a bad job and remain on all fours," Humphrey said. If this had happened in a Western family, Humphrey said, "Everything would be done to persuade and cajole the children to stand upright." But the siblings' father told Humphrey that he didn't regard the seeming handicap as something that needed to be corrected. "He would have been very much more accepting and tolerant of these children, because he thought it was God's will that they should walk like that," Humphrey said. Humphrey also dismisses any suggestion that the researchers and documentary makers have been victims of a hoax. "This is for real," Humphrey said. "You only have to look at the calluses on the hands of the young man [Huseyin] to see he's been on his hands for a very long time." The behavior could potentially reveal much about our own evolution, Humphrey says. "Here we've got a living example of how it might be for a member of our species to walk on four legs," he said. Most experts assume that the quadruped ancestors of humans walked in a similar way to apes such as gorillas and chimpanzees. But the Turkish brothers and sisters walk on only their wrists or the heels of their hands, with their fingers held off the ground, the researchers say. This position appears to have saved their fingers from damage; the sisters, for instance, engage in both crochet and embroidery. Chimps, our closest living relatives, use their whole hands and fingers for walking. "Chimpanzees basically wreck their fingers by walking on them," Humphrey said. The few fossil clues to how early-human ancestors moved are fragmentary and difficult to read, the evolutionary psychologist added. "I think this new evidence, suggesting that [early-human ancestors] walked on their wrists, is much more plausible and interesting," Humphrey said.